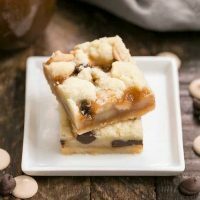 Chocolate Chip Caramel Butter Bars are a decadent twist on an old favorite, caramel butter bars. 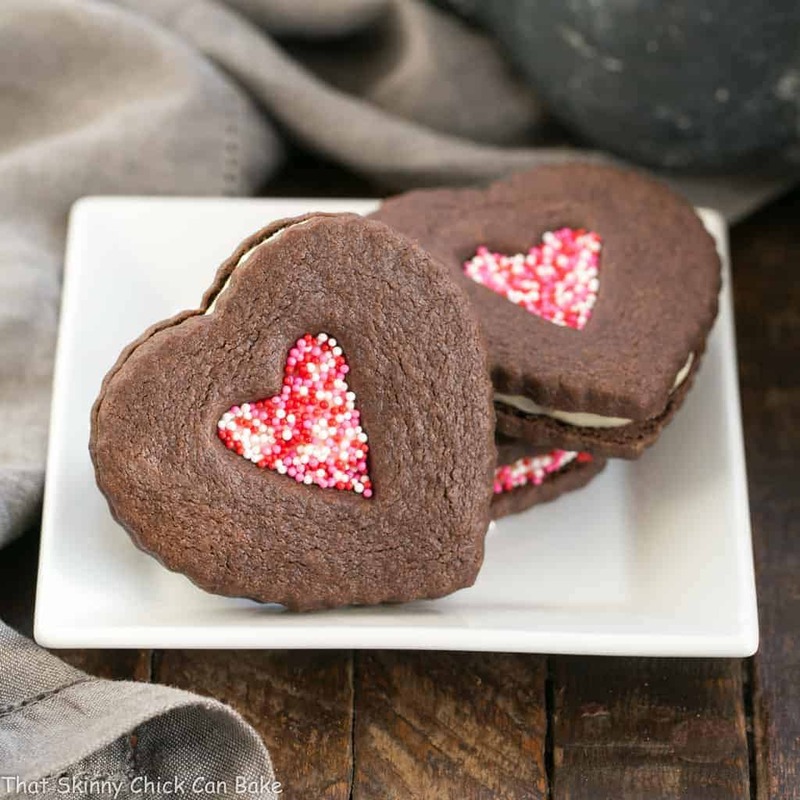 Adding chocolate makes these gooey treats even more enticing! It’s no secret that I love caramel, whether it’s microwave caramel sauce, homemade soft chewy cream caramels or a caramel tart, I love ’em all. Where the hubby prefers a 3 Muskateers Bar, as a kid I’d always go for the Milky Way with the additional caramel layer. I’ve made plain ol’ caramel butter bars in the past, which are dreamy to say the least, but these gooey numbers are amped up with a smattering of chocolate chips, plus I had some Ghirardelli caramel baking chips so I tossed in a few for good measure. Bar cookies are an easy alternative to individual cookies. Even though there are two separate baking times in this recipe, it’s still easier than shaping out and baking up numerous cookies. 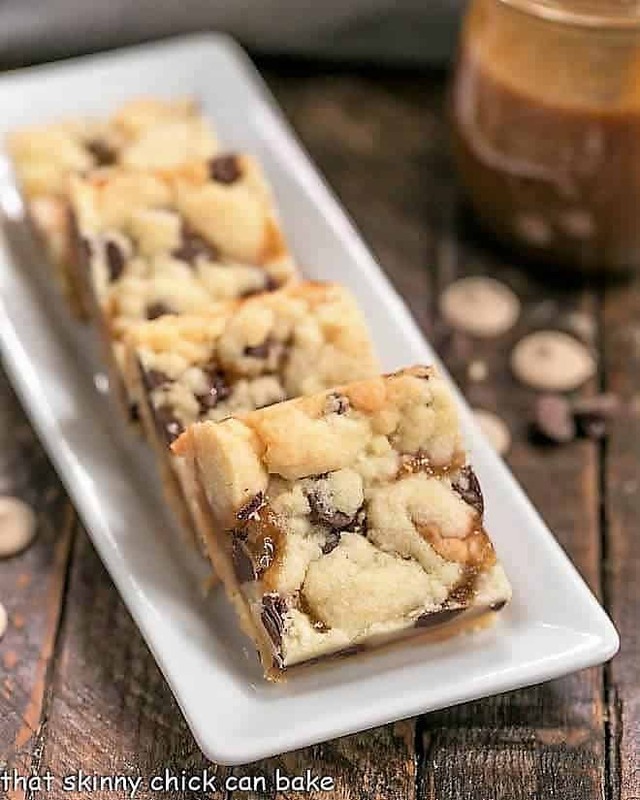 Here are a few pointers for making these yummy chocolate chip caramel butter bars. Since the hubby is not the hugest caramel fan, I made half a batch. Most times you can bake half a batch of cookie bars that would have been made in a 9 x 13-inch in an 8 x 8-inch pan. The square inches of half the 9 x 13 is 58.5 and the square inches of an 8 x 8 pan is 64. Close enough! Line your baking pan with non-stick foil or regular foil sprayed with a non-stick cooking spray like Pam. If you do not, the caramel can ooze from the bars and stick to the sides of the pan making it nearly impossible to remove the cookie bars. I like to pat the crust into the pan evenly using my fingers. Then I go back using the bottom of a measuring cup and press on the surface to even it out. You may need to dust the bottom of the cup with flour to prevent sticking. I use an offset spatula to spread the caramel across the surface of the warm crust. I like to pinch small pieces of the remaining dough to make the crumble topping. If you add some extra chocolate chips, make sure to incorporate some into every piece so that they’re evenly distributed. After they’re cooled, use the foil as a sling to remove the bars to a cutting board to slice. If some of the caramel happens to have escaped the foil, use a table knife or offset spatula to run around the perimeter of the pan to loosen. Check out my post on How to Cut Perfect Cookie Bars for more tips. If I haven’t enticed you enough with caramel recipes on the blog, here are a few from my favorite bloggers. 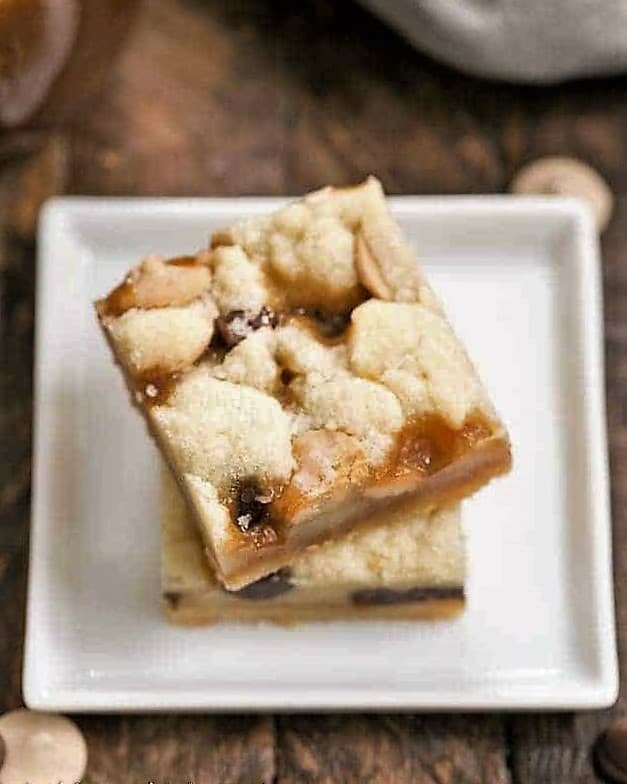 If you’re serving a crowd, this Caramel Apple Sheet Cake looks magnificent! This Chunky Turtle Ice Cream is swirled with dreamy salted caramel! 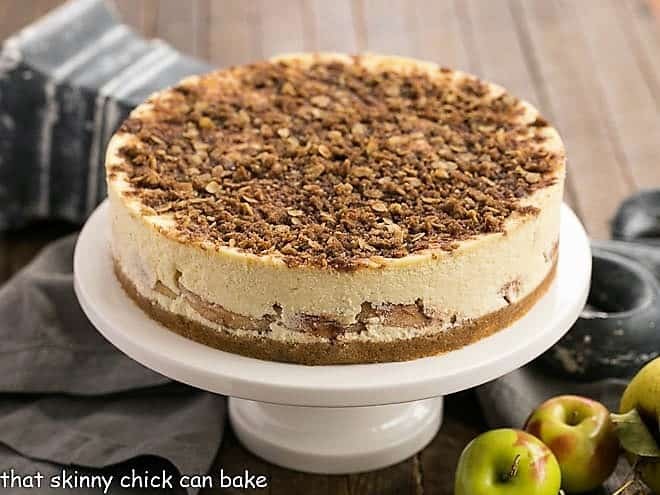 This over the top Salted Caramel Apple Crumble is a twist on the classic apple crisp! Thanks again to my lovely friend, Danielle, for another magnificent recipe! She is my go-to blogger for decadent treats. I promise you will love whatever you try from her blog!!! We share a recipe from each other’s sites every second Monday of the month. Check out Danielle’s take on this recipe as well as her social media sites! Plus make sure to stop by her blog and check out which of my recipes she made this month, too. 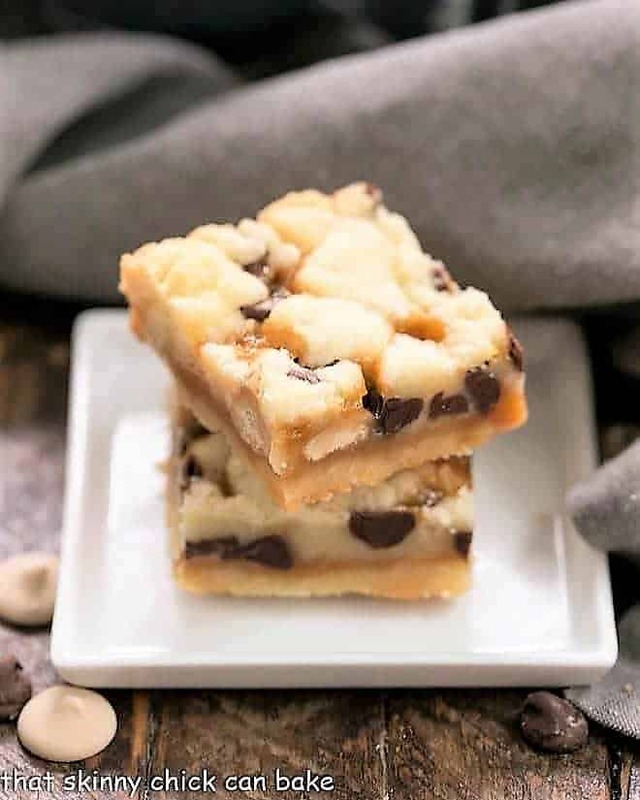 Gooey caramel butter bars enhanced by the addition of chocolate chips! 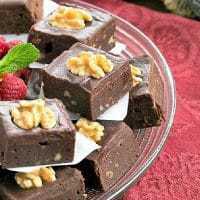 Line an 8 x 8-inch baking pan with nonstick foil. Beat butter and sugar (granulated, not the powdered) until creamy. Add powdered sugar and vanilla. Add flour and mix to form the dough. Press half in the bottom of the pan. Add chips to rest of the dough, then cover and chill. Remove from the oven and pour the caramel evenly into the crust. Spread with offset spatula. Bake 25-30 minutes. Middle may look slightly underdone. Remove and cool before cutting into bars. I made a half batch of Danielle’s recipe. Double to make a 9 x 13-inch pan. I did not reduce the chocolate chips, so if you double, feel free to use 1/2- 1 full cup. They are decadent and utterly delicious with the combo of caramel and chocolate! Saw these on FB and had to come over and check it out. 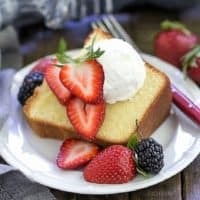 What a terrific recipe – they sound and look fantastic 🙂 Pinning! Ooo I can’t resist a caramel and chocolate duo. These look so yummy! Pinned! Caramel is my kryptonite, I can never get enough of it. These bars look amazing. You had me at chocolate chip and caramel! 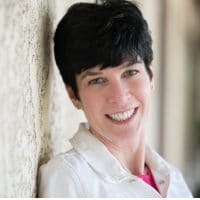 🙂 These bars look perfect, Liz! I with you–I love caramel! I don’t think I’d want to share these. Wow Liz…what not to like in these bars? Chocolate chips, caramel, butter…it sounds and looks like heaven! Thanks for the recipe…have a wonderful week! Buttery cookie base, caramel, chocolate… Indeed, I couldn’t ask for more; that’s a perfect treat to me. As a huge fan of dulce de leche, I should try this recipe with it too. Delicious! 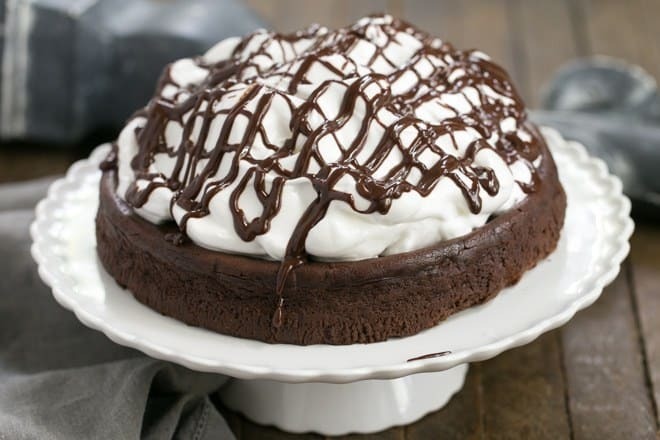 Adding chocolate makes everything better! Yum, chocolate and caramel are such a tasty combo. Love it! I’d love these bars, too — such a nice looking recipe. Really good — thanks. Looking forward to trying this recipe, Liz! Bet they will disappear quickly! Thanks for the recipe. Liz you make the best bars. My last attempts were not impressive. No idea why. These look so wonderful with added chocolate chips! 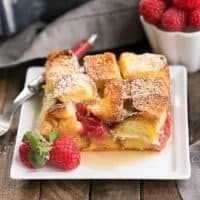 These look amazing and sound absolutely delicious! You make them look so perfect. Thanks for the great tips. 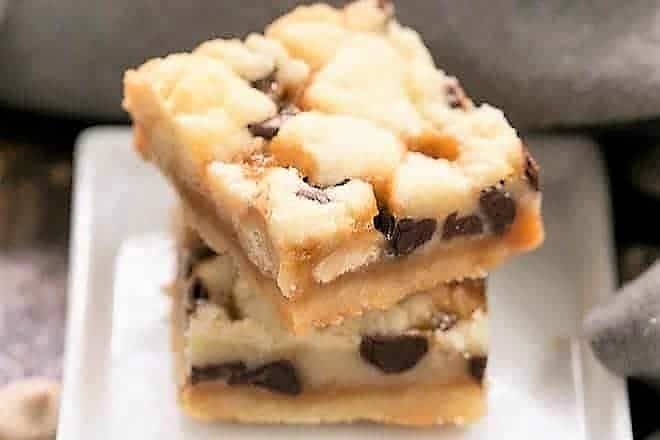 I love making bar cookies and will have to try these. How can you go wrong when you add chocolate to caramel?? My mouth was watering just reading the name of the recipe! So simple and satisfying! 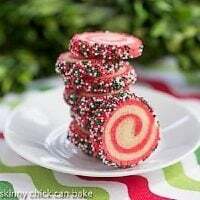 I can not WAIT to make these…..I love how easy they are! You have caramel chocolate heaven right there! Bill has no idea what he is missing out on. Bars are no much better from a time perspective then making several batches of cookies. Totally agree. Just pinned for later. Just when I thought I’d baked enough for a while I find these little gems. Luckily, there’s always room for more dessert at my house. These Look incredible! Can’t wait to give these a try!